Let’s just talk about the cast, this film brought back EVERYONE! Amanda Seyfried looks better than ever, WOW, and her voice was on point. Christine Baranski and Julie Walters were amazing together again. I just love their characters. Pierce Brosnan was sweet in the film and really gave some heart. It’s looks like he was trying really hard, so I am throwing him a bone here. Colin Firth and Stellan Skarsgård were very funny again and added a lot of heart. Cher still has it let me tell you and she looks fantastic! Meryl Streep delivers a very emotional song and I really enjoyed her being back as she was. Some new faces Lily James and Andy Garcia were fantastic as well. Andy Garcia steals the show for me personally. Lily James though was simply perfect as a younger Donna. Her voice is extraordinary and she really nailed that carefree spirit and made you want to be like her (except for the three random hook-ups). I loved her in “Cinderella” and she is even more amazing in this! Like I mentioned at first I thought this would be unnecessary, put I feel like the sequel does have some extra life in it that I didn’t expect. It takes place tn years after the first “Mamma Mia!” (which grossed more than $600 million around the world). In the film, we return to the Greek island of Kalokairi, where Sophie (Amanda Seyfried) running planning a grand re-opening of Donna’s (Meryl Streep) villa, who had past away a year prior. She finds herself thinking about her relationships and her future. With the arrival of friends and family to support they guide her through the opening event. Plenty of surprises along the way including an appear from Sophie’s grandmother played perfectly by Cher. The story intertwins with a flashback of Donna when she is young and how Sophie was led to be born, which also connects with Sophie today. Let’s not forget the music now. “Mamma Mia” wouldn’t be “Mamma Mia” without the songs of ABBA. There is a decently balanced combo of new songs mixed with a few songs redone from the first film. At first, I really wasn’t too keen on hearing the same songs again but they were really well done, specifically “I Have A Dream” by Lily James. 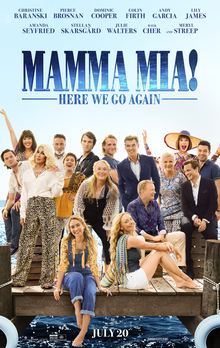 When you think about “Mamma Mia” though, I would want to hear “Dancing Queen” and songs like that, so this movie does not disappoint at all. This is a fun movie that has a really good heart and even though a little cheesy but you leave the theater smiling (and a little teary).